Bluebell flowers are a firm favourite of mine and I always look forward to this time of year as they begin to emerge. There's a bluebell wood that I pass on the school run each day and the Sunday before last (with our new puppy, Guy), we were there to witness the first bluebell flowers coming through for this season - what a delight! It's perhaps no surprise, that I was again inspired this year to paint bluebell flowers. With this new piece (see below), I've painted a 'carpet' of bluebell flowers using mainly watercolour and a little acrylic. By the way, if you're interested in my painting, you can read/see more about it here. Apparently, the bluebell has been discovered as far back as the bronze age and has been used for various purposes, some bizarre. I know you aren't supposed to pick them but hadn't appreciated why - after looking at a factsheet produced by the Woodland Trust, I see that bees bite a little hole in the bottom of the bell making it unnecessary to pollinate the flower. Interesting what you find out about flora and fauna that's been a part of your life and memories for so long. The factsheet has some really interesting trivia contained within. I read the other day how crowds (in the UK) had crumpled swathes of bluebell flowers and that the National Trust were having to charge people to view the bluebells in order to protect them. As a little extra, I shared this video on Instagram - it shows me painting in some leaves to the trees for extra detail. 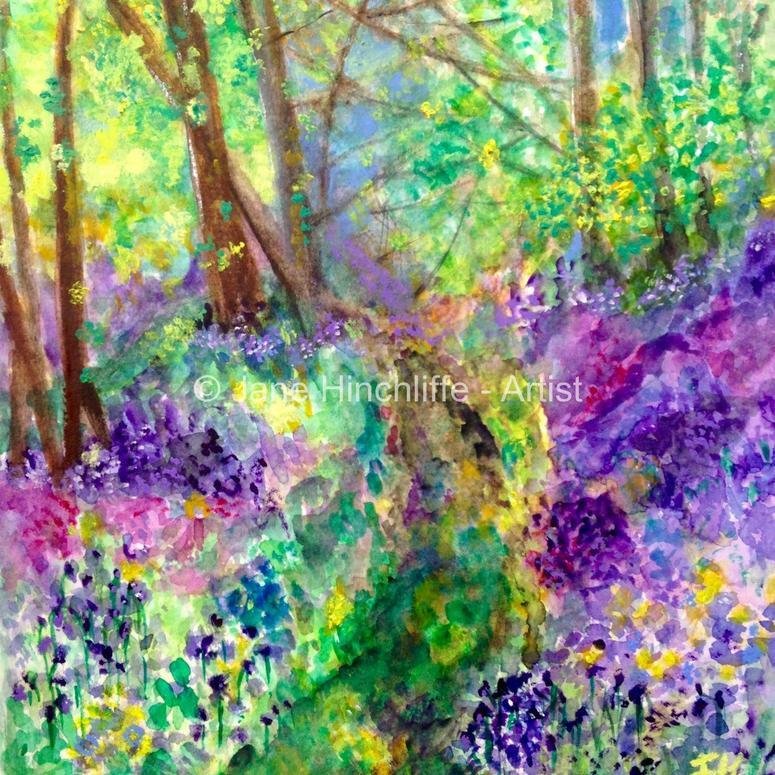 So, I do hope you like this new painting and that you manage to take a look at some bluebell flowers if you have any flowering nearby. In amongst dodging rain, wind and hail, I'm really enjoying creating various pieces at the moment. Above, is my first attempt at digital painting via hand and I'm offering this gorgeous piece via my Etsy shop. What fun! I've also been really enamoured with watercolour and have made a few new ones to replaces originals that have now sold. Here's my latest which was inspired by my Granny's love of patchwork quilts and my happy memories of them. This is also available via my Etsy shop. This cute owl painting below was also completed and was commissioned for my agent in the USA.